All Early Bird tickets will receive a complimentary 1-year Individual Museums membership! Purchase your tickets today! Volunteers are needed as docents and House Captains for the 2013 Historic Homes Tour. Volunteers will receive half-price tickets to the Homes Tour if they are interested in viewing other homes on the tour. The half-price tickets are $20. Both morning and afternoon shifts are available for Saturday (2nd) and Sunday (3rd). Shifts are 3 1/2 hours each. If you or anyone you know are interested please email HHT@museumsoflosgatos.org or call 408-395-7386. Immerse yourself in the world of art through this engaging series of presentations and open discussions with artists and art professionals. All art:inFOCUS evenings begin at 6:00pm with a rotating schedule of gourmet treats, a wine reception and live music, followed by a presentation at 7:00pm. All lectures will be held at The Art Museum of Los Gatos. Come "backstage" to experience the stagecraft of set designers, costumers, make-up and lighting artists as The Museums of Los Gatos presents Unmasking the Stage: The Visual Artists Behind the Theater Experience. This captivating exhibition brings you the work of talented designers from the Bay Area Theatre community and immerses you in their vision. Discover the processes these artists use to create a sense of place and time, real or imagined, for their theater audience. Unmasking the Stage runs from January 28-March 30, 2014. The panel will feature a lively conversation with four Theater Arts professionals (such as set designer, costumer, director, actor). Season and individual tickets are now available! All series tickets include a complimentary 1-year individual membership. Membership brings benefits that keep you coming back - for critically acclaimed exhibitions and programs from established and emerging artists that help to expire, explain, and define the world around us. Your membership support provides the foundation for our exhibitions, education programs, publications, community projects, and more. Take advantage of great benefits, and support the vitality and diversity of arts in our community. Become a member today! In 1924, writer and lawyer C.E.S. Wood and poet and suffragist Sara Bard Field built an estate in the hills above Los Gatos. 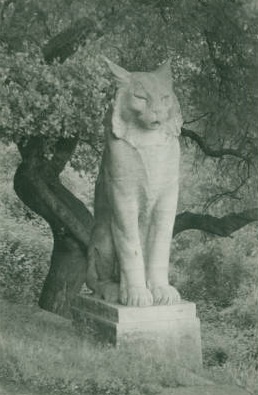 This now 75-acre estate, dubbed “the Cats” after the 8-foot cat sculptures that graced the front entrance, served as a creative retreat and home for Wood and Field until the mid-1950s. American Bohemia explores the storied lives of Wood and Field, acclaimed literary figures and intellectuals, and their home, which became a gathering place for some of America’s most significant artists and writers including Robinson Jeffers, Ansel Adams, John Steinbeck, Ralph Stackpole, and Lincoln Steffens. Film screening of C.E.S. Wood. An Oregon Public Broadcasting documentary produced by Oregon Filmmakers John deGraff and Laurence Cotton. First public reading of Wood’s personal Christmas letters to family and friends. Reproductions of the letters will be available for sale. The History Club of Los Gatos | 123 Los Gatos Blvd. A theatrical performance by Bonda Lewis as Sara Bard Field and a dramatic reading of C.E.S. Wood’s satirical masterpiece Heavenly Discourse. A salon-style evening of conversation, food, and drink with scholars of the lives of Sara Bard Field and C.E.S. Wood and their time in California. Join The Museums of Los Gatos and Los Gatos Poet Laureate Erica Goss for a kick-off to National Poetry month with an afternoon of poetry celebrating the literary works of Sara Bard Field and C.E.S. Wood. Connect with a community of people who love art and history. Enrich the lives of adults and children in your community. Be the first to learn about the newest exhibits.